7 incredible Farmers' Markets to visit in 2017! Do you know where your food comes from? While there are major grocery chains that offer organic options and might even try to capitalize on the Farm to Table movement, in the end you have to take their word for it. That's one reason why farmer's markets have seen something of a renaissance; people aren't just worried about what is in their food, but where it comes from. And what better way to make sure you know how your food was grown or raised than by buying it directly from the farmers themselves? It used to be that the only way to guarantee that kind of freshness was to visit the farm yourself. However, thanks to the revival of farmers' markets even people living in the country's most densely urban areas can enjoy farm fresh vegetables, artisan meats, and hand made preserves directly from the people who made them. New York has quite a few farmers' markets. There are enough that you can manage to shop for groceries exclusively at farmers' markets. With such a wide selection of markets (let alone vendors at each market) it can be hard to choose just one to call the best. However, the Botanical Gardens Greenmarket is ranked #1 by TimeOut New York. In addition to free parking and admissions to the gardens, the Greenmarket even accepts EBT and SNAP funds for farm fresh fruits and vegetables, making it a top selection for the budget conscious. With over 900,000 shoppers each year, the Santa Monica Farmers' Market always draws huge crowds, but not just for the fresh produce. The market also hosts local bands performing their music live on stage, as well as panels and discussions on a wide variety of topics led by experts in their fields. The market opens on various days of the week, year round and rain or shine, although in Santa Monica you can usually count on shine. 3. Charleston Farmers' Market in Charleston, South Carolina. The Charleston Farmers' Market is held in Marion Square, the heart of the city's historic downtown. Which means that once your grocery baskets are full of locally grown blueberries, garden herbs, and fresh cheeses, you can indulge in more traditional shopping for less perishable goods. If you need more space, vendors include artisanal makers of fine bags and baskets. This market is seasonal, open from April to November, although there is also a Holiday Market open in December. The Pittsburgh Downtown Partnership holds this market seasonally in the center of "dahntahn" as the locals call it. Pittsburgh these days is home to numerous small crafters of brews, breads, hand-made fudge, and many more flourishing small businesses that signal the city's renaissance. Many of them are represented at the Market Square Farmers' Market as well as numerous other activities organized by Pittsburgh's various neighborhood associations, but the real stars of this market are all the purveyors of fresh vegetables and dairy from farms just outside city limits as well as across Western Pennsylvania. 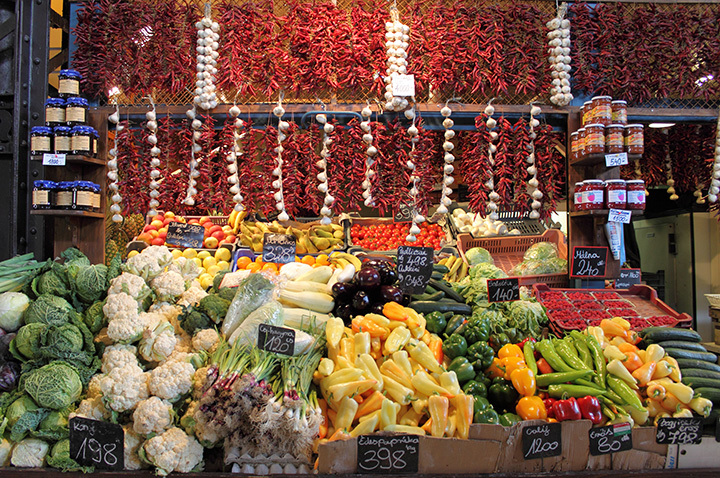 USA Today has labeled the Boulder County Farmers Martkets the Number 1 destination in the country for fresh foods and produce. The BCFM organizes markets at least three days a week from April to November, with two in the city of Boulder and another in nearby Longmont. The non-profit that created these markets and runs a cafÃ© at the Boulder Public Library was founded by farmers and is still run with an emphasis on creating a connection between consumers and food producers. Farm Fresh Rhode Island runs both summer and winter markets, but the winter market is a truly unique experience. Held indoors on Saturdays from November to May, the Wintertime Farmers' Market offers plenty of local cheese, produce, poultry, and freshly baked bread. The real attraction though, besides the carnival atmosphere complete with roaming musicians, is the seafood. Oysters, crabs, lobsters, and a wide range of fish fresh off the boat are on sale, often by the people who pulled them out of the water. The market is proud to offer a $2 bonus for every $5 of SNAP money spent. Since the 1960's this market has been providing residents of Northern New Mexico with the freshest foods and ingredients around. Products at the market have to adhere to strict quality control standards. 100% of fruits, vegetables, and nursery plants must be grown in the northern part of the state, while at least 80% of all ingredients and materials in food and craft items must also come from local sources. This is about as local as you can eat, and the selection reflects it. Expect to find plenty of ingredients for South Western cuisine on hand.